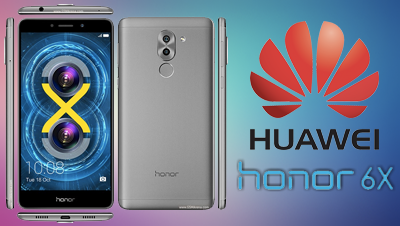 Huawei has launched their latest Honor device the 6X, almost a year after the 5X which was a hit with the young crowd, offering spec you’re more likely to see in a premium device. With a Dual Camera setup, it’s clear Huawei aren’t afraid in trying something new to appeal to the younger, selfie crazy audience. Let’s find out if the phone lives up to the hype! The Honor 6X is a 5.5” full HD device with 2.5D curved glass on top. The full HD screen has a 403 ppi density and bright, crisp with no issues in direct sunlight. It’s slim for its size and comfortable to hold single handedly, though the back is matte finished and sometimes a tad slippery. However, it seems Huawei missed a trick putting the Honor logo directly beneath the screen, as with it also being present on the back, it could’ve easily been omitted for the sake of saving space, and potentially allowing the device to be even more compact. The branding is just increasing the length of the phone! At the top on the right of the earpiece you find the 8MP camera, while on the left is the strangely similar sized proximity sensor. At the top left edge, you’ll find the 3.5 mm headphone jack with the noise cancelling mic to the right, and the bottom centre housing the micro USB port. This is flanked by stereo speaker looking grills on either side. Unfortunately though, only the right one is the speaker while the left is the microphone grill. Quite a lot of manufacturers are following this design principle for aesthetics! Meanwhile, on the right edge you have the volume rocker and below this the power button. The left edge has the Hybrid dual SIM slot that can also house a micro SD card (up to 256GB). Hardware wise, Huawei has been following the policy of using its own manufactured chipsets and does put in the Octa core Hisilicon Kirin 655 SoC on the Honor 6X. It’s supported by Mali T820 GPU and 4GB of RAM with 64GB internal storage. The phone is powered by a 3340 mAh fast charging battery. There’s also a simple home screen style that will show only default apps like Phone, Messaging, Camera etc. in a tile like format. With the fingerprint scanner you can swipe to scroll photos or take pictures, and even answer calls and snooze alarms. The on screen navigation buttons can be customised as well and you can add a screen lock or notification drop down button in addition to your regular 3 home, back and menu buttons. You can also access app lock, safe, private mode using fingerprint security. Floating dock is a nifty accessibility option, appearing as a translucent button that always stays on the screen even when apps or games are open. Pressing on the button gives you shortcuts to back, menu, home, screenshot or lock screen options. Furthermore, the Screen View option lets you downsize your 5.5” screen to 4” for ease of use single handedly. There’s some bloatware on the phone but you’ll be relieved to hear that these apps can be removed. The convenient Hicloud app let’s you save all your data on the cloud, while Social Channels lets you combine your Facebook & Twitter in one app and see all feeds together. The 12MP rear camera has a wide aperture range of f/0.95 - f/16 and by adding the 2nd 2MP rear camera it let’s you take great Bokeh / background blur effect photos . The camera uses Sony IMX 386 sensor and has PDAF. It takes great pictures in daylight and the wide apertures effect works pretty well to give you great looking portrait shots. The editing option also gives you a wide array of filters and with the Splash effect which greys the whole picture ,you can select the part of the image that should be in its original colour. Camera modes include HDR, Manual, Panorama, Portrait etc. Low light images still aren’t up to the level you’d expect and maybe a dual tone flash would’ve helped. The front 8MP takes good selfies with the beauty shot option and takes wide angle photos up to 77 degrees. The camera setup on the Honor 6X overall is great and you won't be disappointed. I can safely say it’s the best in this price segment. Asphalt 8 and Dead Trigger 2 work smooth on the phone; you’d barely notice any lags or frame drops and the audio also doesn’t disappoint. The phone unfortunately doesn’t support 2K or 4K videos, however they still look great on the 1080p display. I also played Lego Race Off almost 2 hours (it’s rather addictive!) and was impressed at how the Honor 6X kept it’s battery life. However, be aware that the phone does warm up a bit if you shoot a full HD video for more than 10 mins. What’s more, despite boasting fast charging capabilities, I found it still took a surprisingly long time to charge the battery to full capacity. Taking all features into consideration, you’d be better off buying the earlier 3GB version of the Honor 6X, rather than 4GB because of the price difference, even when taking into account the latter’s doubled storage capacity. With tough competition from the Xiaomi Note 4, Lenovo Zuk, ZTE Blade A2, Moto G4 Plus and many others, Huawei comes out on top with the Honor 6X if camera is your prime focus. However, you’d do well to shop around if you’re looking for an all round better phone at this price point.